Some of you have those NTSC TV tuners, and some of you have realized that these NTSC TV tuners will be null and void when that big digital TV broadcasting changeover occurs come February of next year. 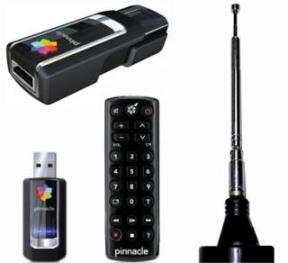 Pinnacle has recently come out with a PCTV HD mini Stick that is prepared for the high-definition television revolution. This is the company’s second foray into the HD Stick, and this version is quite a bit smaller than its predecessor. Part of the reason for its reduction in size is a simple reduction in components. The PCTV HD mini stick can receive unencrypted digital cable TV, as well as SDTV and HDTV signals for a maximum resolution of 1080i. To make up for signal weakness, the Pinnacle PCTV HD mini Stick comes with a high-gain telescopic antenna that functions as a signal booster. It also comes with special software known as TVCenterPro 5, PVR software that uses software encoding to save video content in formats like DivX and MPEG-1/2. Other software included is the Bundled Videospin for editing of video recordings. The Pinnacle for the Mac Version comes with some additional software with Elgato’s Eye TV Lite with time-shifting and manual recording capabilities. The Pinnacle PCTV HD mini Stick will be available on September 21st for a price of $119.99, and you also get the model for the Mac for about $129.99. I have been experimenting with HD digital capture cards the last few months and the pros and cons seem to be universal. First, you need a lot of RAM, at least 3g to 4g and a high end graphics card. Software is usually proprietary to the manufactures card and Windows Media fails to live up to my expectations. That said I will not be surprised when computer manufactures, especially in laptops, consider this technology as standard. nobrainerdeals the best way to find software for your card is to go to the manufactures web site. You may not find a particular codec but, compatible software with the codec embed in the software. I have connected the out put of my dish TV to “Pinnacle PCTV HD mini Stick” but there is no signal. I divided the signal. The other end has signal but not that connected to “Pinnacle PCTV HD mini Stick”. Any suggestions!